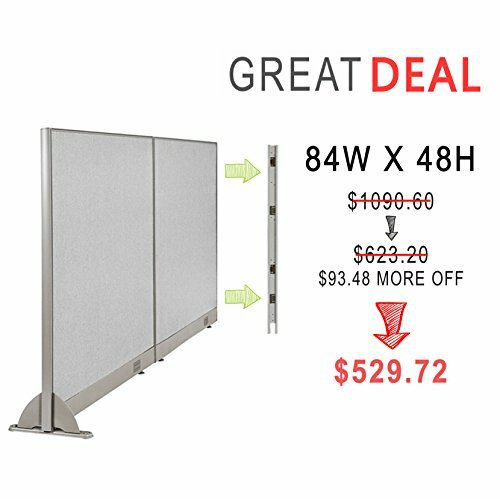 GOF DF5 Series, includes 84"W x 48" Wall Mounted Partition / Qty.1 - 36"w x 48"h Panels, Qty.1 - 48"w x 48"h Panels, 1 Wall Mount, 1 End Bar & 1 Safety Leg Our fabric upholstered office partitions can create a comfortable, functional work environment for any office. Heavy duty, commercial grade office partition panels can be used to wrap around existing desks & furniture to create private cubicles and offices. Whether you need to contain noise, or block off a copy machine, these partitions will make it easy and affordable. Using our Steel Safety Legs you can make our individual partition stand on it's own. All panels come with leveling glides for uneven floors.